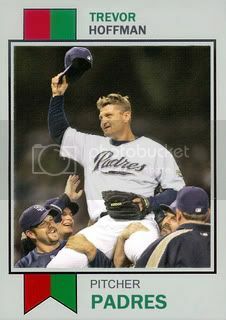 Why Trevor Hoffman? He might just be the best closer of all-time. 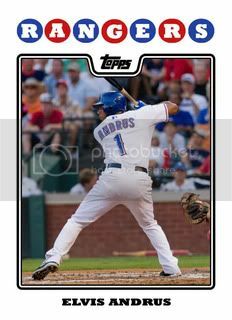 Why not an 08 Topps card? I wanted to try something new and came up with this design that's reminiscent of the 1973 Topps football set. This one came to us from Ryan ( Great Orioles Autograph Project ). 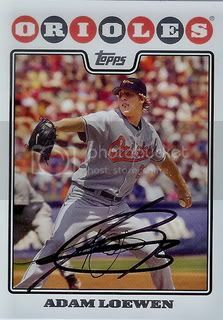 At first it appears to be a regular Adam Loewen signed 08 Topps card but if you turn it over you'll notice that it is numbered differently. That's right. 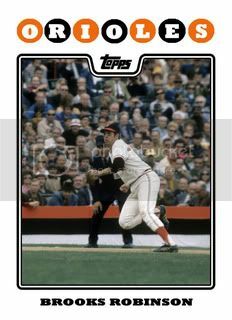 This card is from the 14-card Baltimore Orioles team set. Thanks, Ryan! 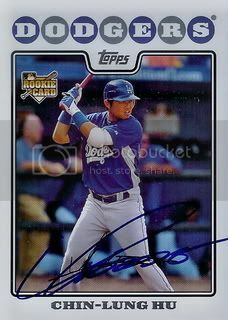 Chin-Lung Hu is currently on the roster of the Albuquerque Isotopes. He's been around for awhile now and I'm not really sure if he's going to make it. According to his Wikipedia article he's only 26 years old so I guess he does have some time. It just seems like we're pretty far removed from when he was named the MVP of the Futures Game in 2007. We received his 08 Topps card back signed from a 50/50 on SportsGraphing.com. Blog reader Dan has helped me out with a few cards in the past and he's come through again. 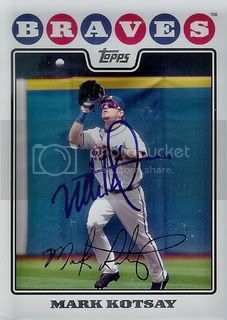 Earlier this month he was over at Progressive Field and snagged a signed 08 Topps card of infielder, Mark Grudzielanek for us. 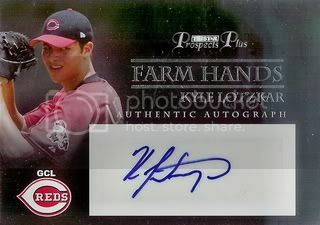 Here's another card that Dan from SweetSpotGraphs.com helped us get signed. Chris Carter signed this card in Buffalo right before he was called up to the Mets. 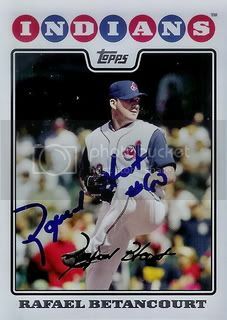 Here goes another card that Dan from SweetSpotGraphs.com helped us get signed. Former Diamondbacks infielder, Alex Cintron is currently with the Mets AAA team. Why Elvis Andrus? He's putting up All-Star numbers in 2010. Elvis Andrus seems to be the next Venezuelan born All-Star shortstop following legends like Luis Aparicio and Omar Vizquel. This year he is hitting .312 with 30 runs scored and 17 stolen bases. If he continues to put up numbers like this, there's a pretty good chance he will be playing in Anaheim this July. 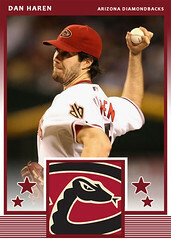 I'm proud to announce another signed 08 Topps card of a former Diamondbacks player. 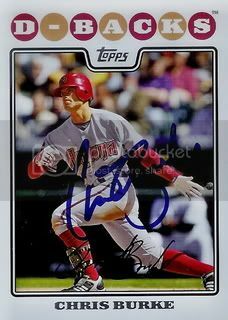 My friend, Dan from SweetSpotGraphs.com, sent us this signed card of Chris Burke. Always great to add signed 08 Topps card for our set but it's even better when it's a D-Back. After spending last year playing for the Yokohama BayStars in Japan, Dan Johnson is back in the United States. 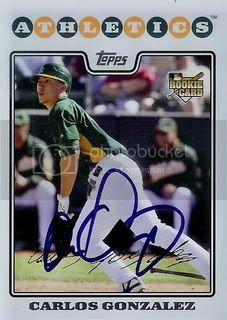 The former Oakland A's first baseman signed a minor league contract with the Tampa Bay Rays and is assigned to their Triple A team. 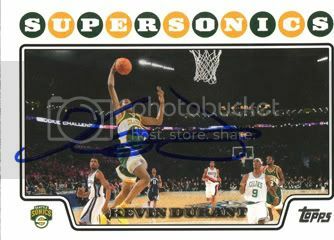 My friend, Dan from SweetSpotGraphs.com, sent this card over with a few others that he got signed for us this year. Thanks, Dan! After spending some time with the Florida Marlins and Kansas City Royals, Mike Jacobs is back with the New York Mets. Mike made his MLB debut with the Mets back in 2005. 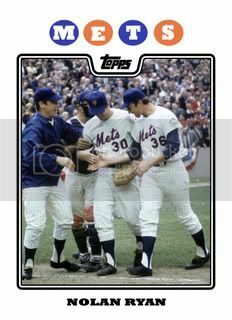 Mike is currently playing for the Mets AAA team, the Buffalo Bisons. My friend, Dan from SweetSpotGraphs.com, is a Mets fan and lives near Buffalo. He sent this card over with a few others that he got signed for us this year. Thanks, Dan! Dave Borkowski managed to put together a Major League career that stretched over 10 seasons without me every even hearing of him. He pitched for three organizations ( Detroit Tigers, Baltimore Orioles, Houston Astros ) and won 13 games. 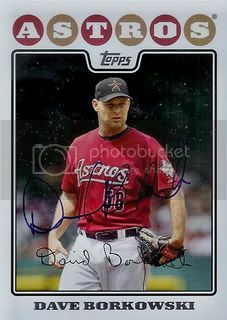 Dave retired after the 2008 season and is now the pitching coach for the Greeneville Astros. I'm glad Ryan from The Great Orioles Autograph Project sent this signed card over the other day. I might have had difficulty tracking Dave down. 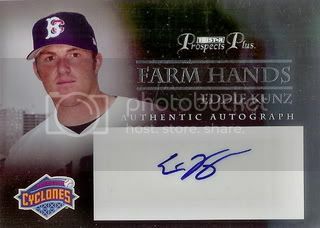 A few years back Jason Hirsh was going to be the next big thing in Texas when he was with the Houston Astros organization. 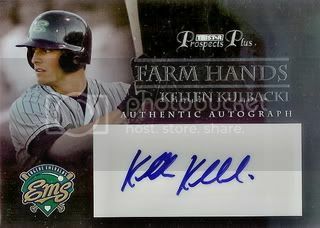 He was named Texas League Pitcher of the Year in 05 and Pacific Coast League Pitcher of the Year Award in 06. He suffered from a few injuries since then but is now with the Yankees and trying to make it back to the big leagues. 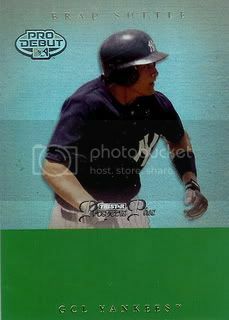 A friend on SweetSpotGraphs.com saw Jason at a recent Scranton/Wilkes-Barre Yankees game and got his 08 Topps card signed for us. I really didn't expect to get this one back. I had written a letter to Mark Kotsay c/o the Red Sox the day before he was traded to the White Sox. I probably should have known better to send out TTM requests right before the trade deadline but I didn't. 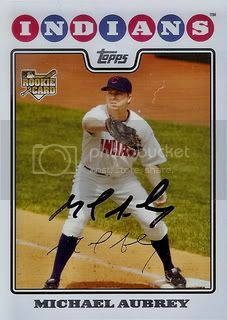 A big thank you to the Red Sox for forwarding Mark's mail to him in Chicago and another thank you to Mr. Kotsay himself for signing a card for our set! Why Nolan Ryan? Dallas Braden's perfect game last Sunday got me thinking about no hitters. Thinking about no hitters led me to think about Nolan Ryan. This is definitely one of the best cards I've gotten signed TTM in awhile. 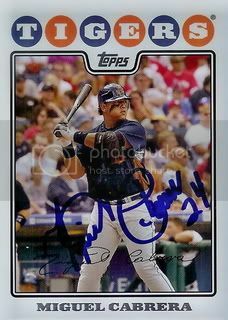 With a small donation to the Detroit Tigers Foundation, All-Star Miguel Cabrera signed a card for our set. 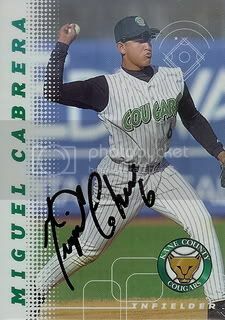 This is the second Miguel Cabrera autograph we have in our collection. 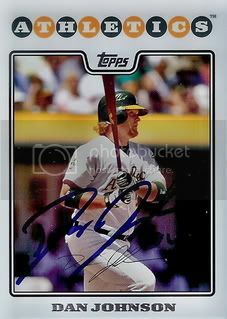 The first was signed back in 2001 when he was playing with the Kane County Cougars. My family and I had gone on vacation to Chicago and I talked my mom and grandma into taking me out to Kane County to see a Cougars game. 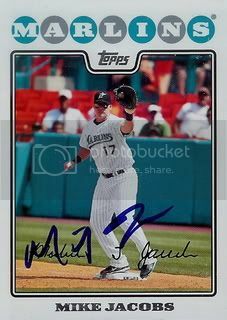 At the time #1 Draft Pick Adrian Gonzalez was playing for them and I thought it would be a good chance to get his autograph. Unknown to me, the day we went was an autograph day. The team had all of the players sitting at four tables arranged on the field. You had to wait in line and were able to go to one table where four or five players were sitting. I had bought a team set in the gift shop so I did have cards for most of them but I was really only interested in Adrian Gonzalez. Gonzalez's table was first. I asked the usher if we could go to that table since I had come all the way from Arizona just to see him. He told me no and that I had to go to the last table. That wasn't what I wanted to hear. On my way to the last table, I had to walk right past the first table where Adrian was sitting with no line. I handed him my cards and as he was signing the first, the usher approached me and told me I had to proceed to the final table. Okay, that was fine. I had gotten the autograph I wanted. I made my way to the final table and pulled out my team set cards of the guys there. I hadn't really heard of any of them before but the first player was some eighteen year old kid from Venezuela. So basically the usher almost forced me to get an autograph of Miguel Cabrera. Wherever you are Kane County usher, I thank you! 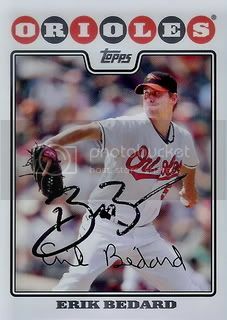 The other day Ryan from The Great Orioles Autograph Project sent over a few signed 08 Topps cards of Baltimore Orioles players. One of the cards Ryan sent was of Michael Aubrey. Michael is currently with the Orioles AAA team, the Norfolk Tides. I was pretty excited to get this card back signed from a TTM request. 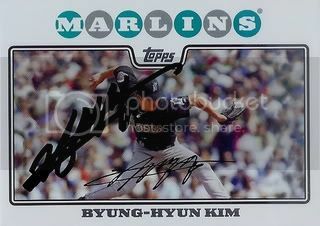 Byung-Hyun Kim was a big part of the 2001 Arizona Diamondbacks team that won the World Series. He was also won a World Series with the Red Sox in 2004. Dodgers star, James Loney must have been catching up on his mail during the offseason. 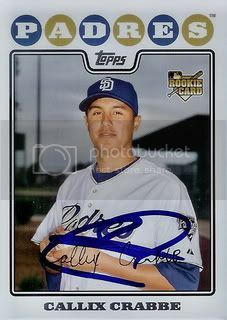 We received our 08 Topps card back signed just before Spring Training started. James is one of several good, young players to come through the Dodgers system. With others like Matt Kemp and Clayton Kershaw, the Dodgers should be a force to reckon with in the NL West for the foreseeable future. It's kind of hard to believe that baseball card companies still have trouble putting a photo of the correct player on the front of their baseball card. 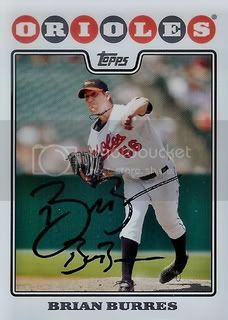 In 2008, Topps mistakenly chose a photo of Brian Burres for Erik Bedard's card. When we sent a request to Brain during Spring Training we sent his regular card as well as Erik's. He graciously signed the card featuring his photo and an incorrect name. 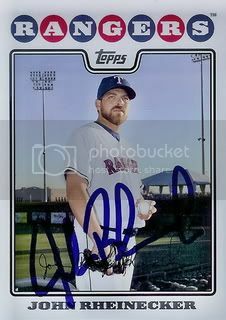 I've actually seen Erik Bedard sign this card too so we'll have to work on getting him to sign it as well. Despite the error, this is another great addition to our set. Got back another Spring Training request. 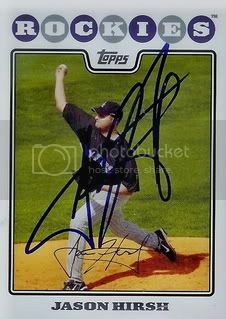 Pittsburgh Pirates pitcher, Brian Burres signed his card from Series 2 of the 08 Topps set. Why Dallas Braden? He threw a perfect game today! 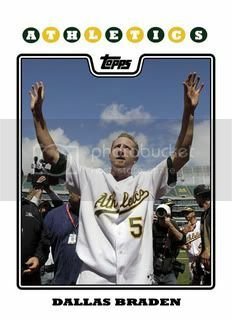 Yah I already posted my card of Brooks Robinson for Custom Card Sunday but Dallas Braden's performance today made me sit back down at the computer this evening and fire up my Photoshop. I noticed that Braden was heading towards history when the game was in the 7th inning. I quickly pulled out my headphones and listened to the rest of the game on MLB At Bat with Gameday Audio. Why Brooks Robinson? He's one of my dad's favorite players. 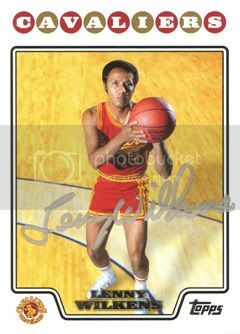 I like making these custom cards for retired players more than current guys so I went with someone my dad enjoyed when he was a kid. My dad and I have both had the pleasure of meeting this Hall of Famer on two seperate occassions over the past few years. Very nice guy. 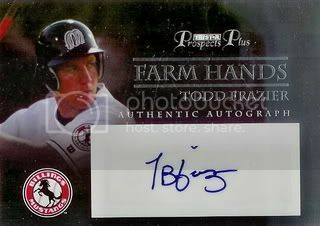 I found another autograph collector on SportsGraphing.com who is working on the 2008 Topps set. Tikitomoka is primarily a basketball collector so he's doing the 220 card NBA set with a little MLB and NFL on the side. He has a Photobucket set up to show off his collection. Check it out here. I was really impressed with the way all of the cards that were signed in silver paint pen. Especially the Topps Chromes. I will definitely have to try this myself. On SportsGraphing.com they have these things called "graph cash auctions." Basically you gain graph cash by posting things and every once in a while someone will offer up a signed card they don't want in an auction for the graph cash. 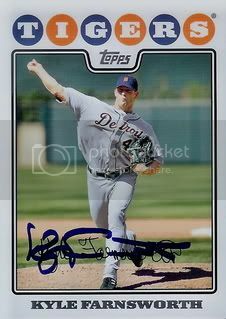 That's how I picked up this signed 08 Topps Kyle Farnsworth card. Cost me a grand total of 750 graph cash. I would have to say it was fake money well spent. I remember when John Rheinecker was going to be the next superstar pitcher in Oakland. After putting up big numbers in 2002, it looked like it wouldn't be long before Rheinecker was joining the big three (Zito, Mulder, Hudson) in the A's rotation. Well that never happened. 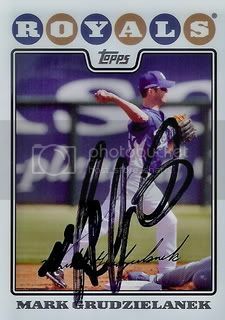 Rheinecker was traded to the Texas Rangers before ever making his Major League debut. He has had some health problems since and hasn't played since 2007. John was always extremely nice when we saw him during his time with the A's. 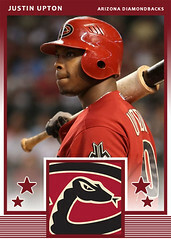 He may not be the best known card in our 08 Topps set but I think this one's pretty cool. Over his 21 year career, Rick Honeycutt was a 2x All-Star and a 2x World Series Champion. 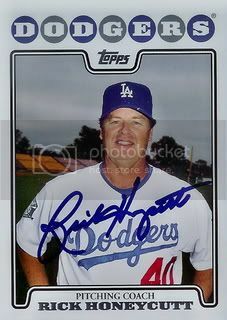 He has been the pitching coach for the Dodgers since 2006. 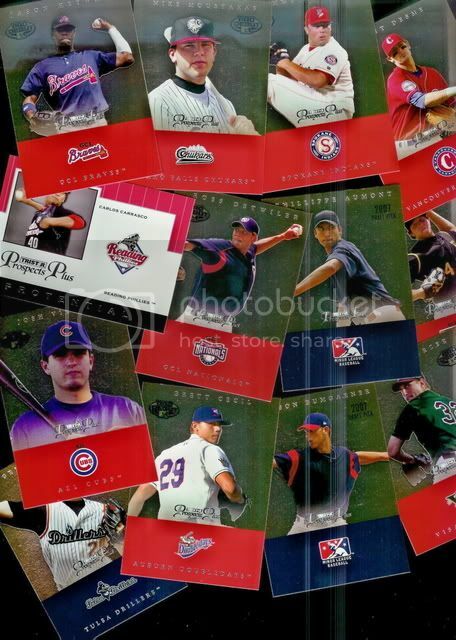 Back in December, I picked up a few of the 55 card team sets that Topps released in 2008. The best part of these team sets is that they had some unique cards thrown in. 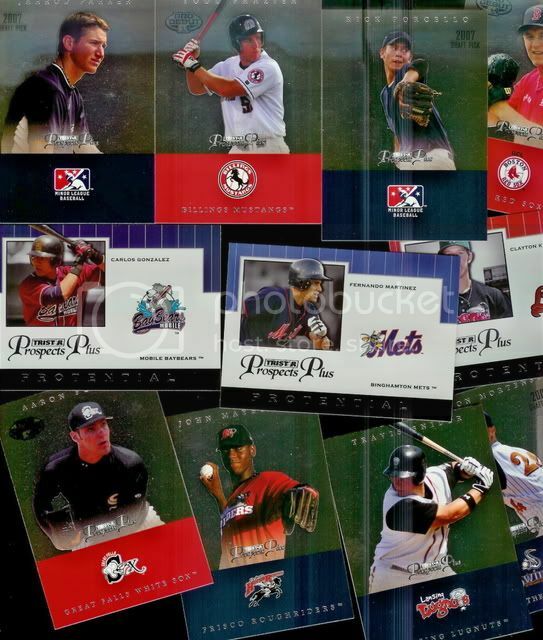 Cards of pitching coaches or hitting coaches aren't very common outside of a minor league team set. 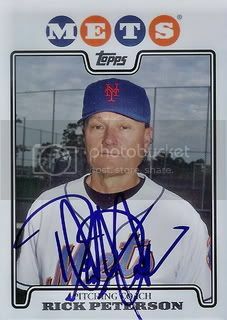 Thanks to the New York Mets team set, I was able to get my first Rick Petersen card signed during Spring Training. Rick has been the pitching coach for the Oakland A's, New York Mets, and is currently with the Milwaukee Brewers. Here's another card we had some help with. 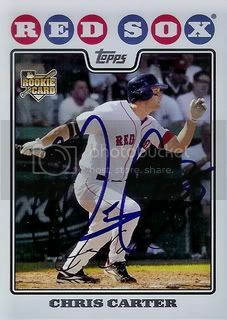 A friend on SportsGraphing.com had Callix Crabbe sign his 08 Topps card for us at a recent New Hampshire Fisher Cats game. After spending some time with the Padres & Brewers, Callix is now with the Toronto Blue Jays organization. His only time with a big league club came while he was with the Padres in 2008. 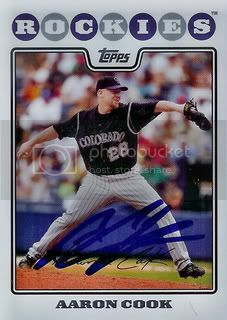 Earlier this year, I sent a few Colorado Rockies cards to a friend on SportsGraphing.com for a Spring Training 50/50. He was able to get a few 08 Topps cards signed for our set. 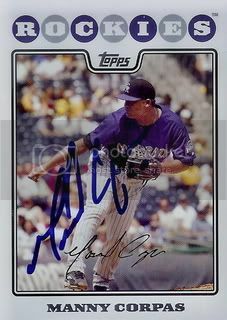 My favorite of the five Rockies autographs we added for our set this week is from outfielder, Carlos Gonzalez. After putting up some big numbers in the minor leagues the past few years, Carlos is turning into a solid offensive threat in Colorado. His call-up last year sparked the team's turn around which ended with the Rockies winning the NL Wild Card. Next up is Rockies reliver, Manny Corpas. Manny has been with the Rockies since he made his MLB debut back in 2006. He has been given the closer role a few times but hasn't been able to establish himself as a pitcher who can close out games consistently. Rafael Betancourt was traded from the Cleveland Indians to the Colorado Rockies during July last season. Since then, he has established himself as a valuable part of the Rockies bullpen. 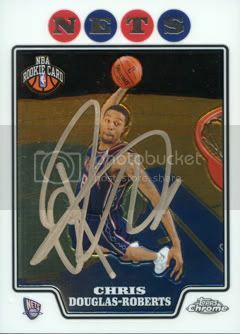 Aaron Cook was named to his first All-Star team in 2008. His 08 Topps All-Star card looks great signed! My pile of signed cards that I still need to post about is still growing. In an effort to get caught up, we'll be having double posts all week long! 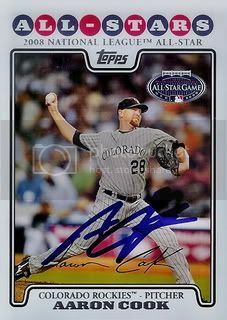 First up is Rockies pitcher, Aaron Cook. Switching Custom Card Sunday up a bit this week. Instead of our usual custom 08 Topps card, today's post is all about Goose Joak Originals. If you are not familiar with Goose Joak or his custom card set, you should definitely check out his blog. This week, I made my first two cards for the Goose Joak Originals 2010 set. Last year's set had over 900 cards. This year, it's already up over 200. To start off my contributions to the set, I decided to go with cards of two of my favorite players from my favorite team: Dan Haren & Justin Upton. We had written to Pittsburgh Pirates pitcher, Paul Maholm last year during the season. 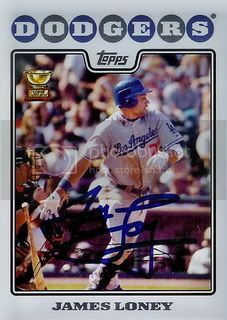 Our 08 Topps card came back signed during Spring Training. I guess Paul used some of his free time in Florida to catch up on his mail. We're glad he did!